Trips and stumbles too often lead to falls for amputees using leg prosthetics, but a robotic leg prosthesis being developed at Carnegie Mellon University promises to help users recover their balance by using techniques based on the way human legs are controlled. Hartmut Geyer, assistant professor of robotics, said a control strategy devised by studying human reflexes and other neuromuscular control systems has shown promise in simulation and in laboratory testing, producing stable walking gaits over uneven terrain and better recovery from trips and shoves. Over the next three years, as part of a $900,000 National Robotics Initiative study funded through the National Science Foundation, this technology will be further developed and tested using volunteers with above-the-knee amputations. Joining Geyer on the research team are Steve Collins, associate professor of mechanical engineering and robotics, and Santiago Munoz, a certified prosthetist orthotist and instructor in the Department of Rehabilitation Science and Technology at the University of Pittsburgh. 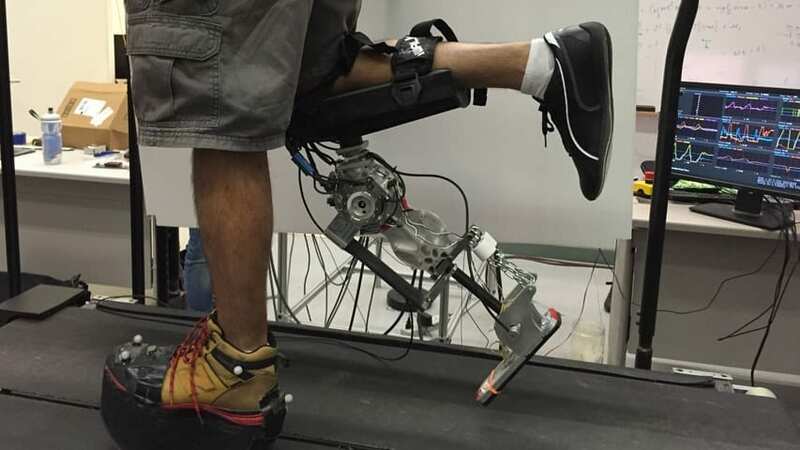 Those principles might aid not only leg prostheses, but also legged robots. Geyer’s latest findings applying the neuromuscular control scheme to prosthetic legs and, in simulation, to full-size walking robots, were presented recently at the IEEE International Conference on Intelligent Robots and Systems in Hamburg, Germany. An upcoming paper in IEEE Transactions in Biomedical Engineering focuses specifically on how this control scheme can improve balance recovery. Geyer has studied the dynamics of legged walking and motor control for the past decade. Among his observations is the role of the leg extensor muscles, which generally work to straighten joints. He says the force feedback from these muscles automatically responds to ground disturbances, quickly slowing leg movement or extending the leg further, as necessary. Geyer’s team has evaluated the neuromuscular model by using computer simulations and a cable-driven device about half the size of a human leg, called the Robotic Neuromuscular Leg 2. The leg test bed was funded by theEunice Kennedy Shriver National Institute of Child Health & Human Development. The researchers found that the neuromuscular control method can reproduce normal walking patterns and that it effectively responds to disturbances as the leg begins to swing forward as well as late in the swing. More work will be necessary, he noted, because the control scheme doesn’t yet respond effectively to disturbances at mid-swing. Powered prosthetics have motors that can adjust the angle of the knee and ankle during walking, allowing a more natural gait. These motors also generate force to compensate for missing muscles, making it less physically tasking for an amputee to walk and enabling them to move as fast as an able-bodied person. March 19, 2019 - How to increase stolen vehicle recovery and officer safety PoliceOne.com Police NewsFrom coast to coast, police agencies are using StarChase technology to reduce the risk and adrenalin when traffic stops go bad. April 17, 2019 - Senators slam Army Corps after Missouri River flooding: 'They are too slow, too bureaucratic' Chicago TribuneThe federal agency that manages dams along the Missouri River received stern criticism from several U.S. senators in the wake of the massive spring flooding. April 17, 2019 - Do all those ‘acting’ assignments at DHS matter? Federal News NetworkAfter so many departures, former CHCO for the Department of Homeland Security Jeff Neal says employees deserve stable leadership for success. March 22, 2019 - Q&A: Green tech solution for polluted Guatemalan lake SciDev.NetOn World Water Day, scientist Claudia Romero says Lake Amatitlan can be cleaned up using natural methods, if authorities act now. April 17, 2019 - Global yields higher after Chinese data easing global growth concerns FXStreetChina data helps to ease concerns over any lasting global economic slowdown; core yields pushing higher as a result - UK Mar CPI YoY reading remaine.